Over the past 10 days, Just For Laughs has been invading the streets of the Quartier Latin and taking over some pretty big venues with the sole intent of bringing a bit of joy and laughter into our lives. 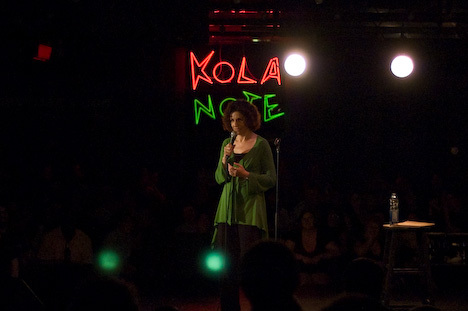 Though there are many events I would've liked to have seen and didn't get the chance to, Saturday night I showed up, drenched to the bone, at Kola Note to see my first stand-up comedy show: The Masters. The venue was full packed, which I hear was the case with many of the JFL events, and brought to the stage seven reputable comedians: Henry Cho, Hal Sparks, Henry Phillips, Thea Vidale, Todd Glass and Billy Gardell (and another one on the photo whose name I didn't get). I expected to laugh a lot more than I did: only one of them really got me off in the comedic sense of the term. Hal Sparks was a remarkable comedian, bubbling with dynamic energy and stories that actually made me laugh. It's hard to tell what really made him stand out so much, but I think that it's really his exuberant energy that filled the room instantly which made him so great. Honorable mentions to Henry Cho who also seemed to have some pretty consistently funny material to share with the audience. His bit was mostly focussed around parenting, which is an easy miss, but he got it right on the nose. Not only was he funny, but I also found that his overall discourse was interesting and caught my attention. For the most part though, the rest of the comedians could barely pull more than a few chuckles out of me. For some of them I'd even go as far as saying that I was completely bored and wished they'd move on to the next comedian soon, hoping that'd be better. I wondered several times, "those are the masters, really?". Even Larry Miller, the big-star host of the evening left my funny-bone completely untouched. A good example of a big miss for me would be Thea Vidale, who went on with very race-oriented jokes, which may work in Texas, but got some pretty negative reactions from the crowd here in Montreal. It's pretty hard to go too far nowadays I think, but when this lady said something about calling out to Nazis to kill the stinky Africans ruining her plane trip, everyone's face dropped. I think I even heard some booing, though I was so shocked that my mind sort of went blank for a second. What really turned me off about this act though is that I felt she banked on her own race to pull some really typical racial stuff, which has been done originally and successfully by a handful of comedians like Chris Rock, but not so much by Vidale. It sounded cheap and unpleasant, much like the bitchy chatter I hear cranky people dump around. Nothing pleasant about that one. Like a friend of mine was pointing out, stand-up comedy is probably one of the most difficult of all acts to pull off on the planks. You can rehearse all you want, but it's so subjective to the audience, their receptiveness and reactions, and to the comedian's particular energy at that very specific moment, that it can hardly be judged fairly by a single performance. What I can say however, is that it's not only the energy of most of the comedians that disappointed me in this show, but it's mostly the material that felt weak and unoriginal for the most part. Too bad. Better luck next time.